With Microsoft Outlook 98 and 2000 you can share Outlook folders, such as your calendar and contact lists with others by email. 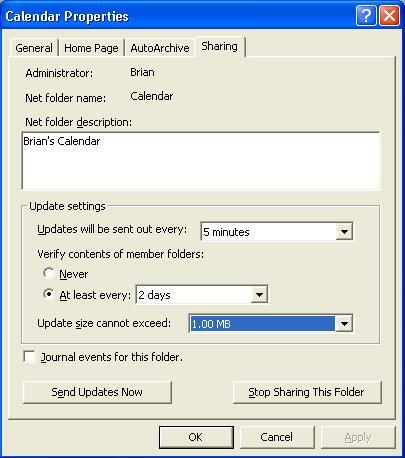 Others using Outlook 98 and 2000 will see your shared folders appear just as they see their own, except they will see "Bob's Calendar", if you happen to be named Bob, instead of just "Calendar". 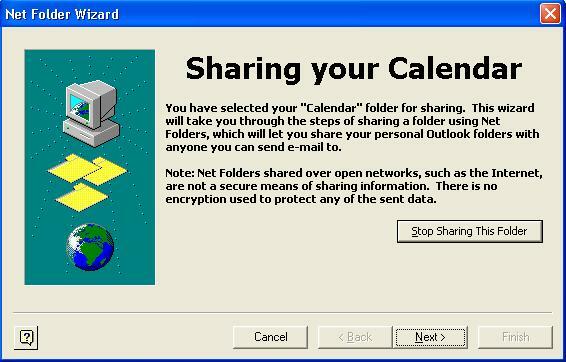 Unfortunately, Microsoft discontinued the Net Folders option for sharing folders in Outlook 2003. Some have suggested that they discontinued it for security reasons or because it wasn't as robust an approach as that provided through Microsoft's Exchange Server software. But I suspect that Microsoft may have more likely been motivated by revenue concerns. If a company uses Net Folders for sharing calendars and contact lists and finds that solution adequate, then they won't likely buy an Exchange or Small Business Server 2003 server. Discontinuing support for Net Folders may force them do buy one of those other Microsoft products. I'll admit I've seen instances where shared calendars get in a state where horrific numbers of duplicate entries start appearing. When that has occurred, I've stopped the calendar sharing, deleted the shared copies of the calendar from others' systems and then reshared the calendar after eliminating the duplicates. I believe that can occur when Outlook appears to have terminated on a system, because of some problem within Outlook, but is actually still running invisibly to the user. The user reopens Outlook and then has two copies running. Only one is shown on the taskbar, though. You can stop the other instance or instances of Outlook from running by closing Outlook and then bringing up the task list with Ctrl-Alt-Del. Then click on the Processes tab to view the list of running processes. Then click on Image Name to sort the processes in alphabetical order. Click on any instances of Outlook you see and then click on the End Process button. Ignore any warnings about the possibility of losing work by closing the application, since there is nothing you can recover in this situation anyway. Click Start, then Settings, and then click on Control Panel. Click Microsoft Office 2000, and then click Add/Remove. Click Add or Remove Features. Click the plus sign (+) next to Microsoft Outlook for Windows to expand the branch. Click the icon next to Net Folders, and then click Run From My Computer. Click Update Now to install the feature. Click OK when Setup has finished. In Outlook, click on File. A Sharing your Calendar window will appear (see Figure 1). Click on Next. A Net Folder Wizard window will appear. Click on the Add button to add a recipient for the shared calendar. Recipients will appear in the Net Folder Wizard window once you have added them. 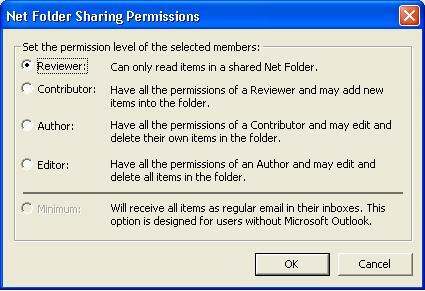 By default, Outlook will give a recipient of the shared folder "reviewer" permissions. If you wish to allow a recipient to modify the calendar, select that recipient by clicking on his or her entry and then click on the Permissions button. If you want to change the permissions for more than one recipient at the same time, hold down the Ctrl key while clicking on other recipients. Reviewer Can ony read items in a shared Net Folder. Contributor Have all the permissions of a Reviewer and may add new items to the folder. Author Have all the permissions of a Contributor and may edit and delete their own items in the folder. When you have picked the option you wish to use, click on OK.
You will then see the final Net Folder Wizard window (see Figure 3) telling you that "You have finished setting up folder..." Click on Finish to complete the process. A message or messages, depending on how may people you've selected to receive your shared folder, will be placed in your Outbox to be sent to those you specified. They will receive a message that, when they double-click on it in Outlook on their systems, will ask them if they wish to receive the shared folder. If they click on the Accept button then a message will be sent from their system to yours by email notifying Outlook on your system, that the person has accepted. If someone doesn't see an Accept button when they receive the message, then it is likely your system isn't configured to send email to that person by HTML, but is likely set to send messages as plain text messages instead. You can tell whether someone has accepted the shared folder or if, instead, your system is still waiting for a reply by repeating steps 1 through 4 above, which will bring you to the point where you could add others to the list of recipients for your shared folder. If you see "waiting for..." after the person's name, then your system hasn't yet received and processed an acceptance message from the other person. You can just click on Cancel at this point and your system will continue to wait for that message. Even after your system has received the acceptance message, which should be processed automatically, so you don't see the message, it may take it a minute or two before it removes the "waiting for..." indicator. Once it has received an processed an acceptance message, it will start sending messages to those who have accepted the shared folder. You can change how often updates are sent by right-clicking on the shared folder and selecting Properties. Then click on the Sharing tab. Change the value of Updates will be sent out every to your preferred value (see Figure 5). You can't increase the frequency beyond every 5 minutes. You can also control the size of the messages that are sent by changing the Update size cannot exceed value. The value can range from 0.25 to 2.00 MB. If the size is larger updates can be sent in fewer messages, but it may take longer for the recipient to download a particular message. You can do the same thing on a recipient's PC to control how often modifications they make, if they have that permission, are sent back to your system.